Yemenis have held a demonstration in Sana’a to demand the dismissal of ex-regime remnants loyal to former dictator Ali Abdullah Saleh. Chanting “The Local Government is a Remnant of Saleh’s Regime,” and “Down with Remnants of the Regime, We Will Lead Our Revolution Forward,” on Monday the demonstrators also called for the trial of Saleh and his aides over the killing of anti-government protesters during the country’s revolution, which began in January 2011. 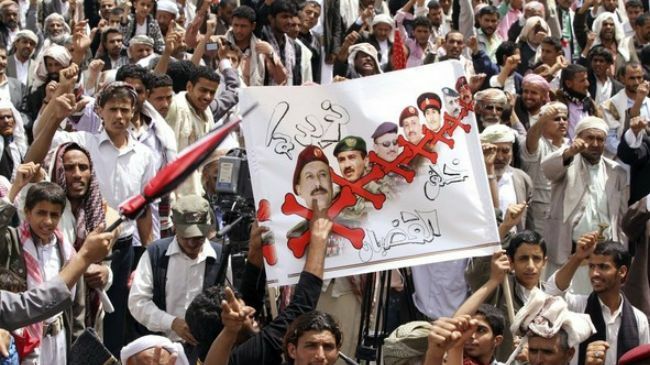 The revolutionaries were joined by Yemeni security forces, who called for a restructuring of the country’s armed forces. Ali Abdullah Saleh, who ruled Yemen for 33 years, stepped down in February under a US-backed power transfer deal in return for immunity, after a year of mass street demonstrations demanding his ouster. His vice president, UK-trained Field Marshal Abdrabuh Mansur Hadi, replaced him on February 25 following a single-candidate presidential election backed by the United States and Saudi Arabia. Hadi will serve for an interim two-year period as stipulated by the power transfer deal. On April 6, Hadi dismissed nearly 20 high-ranking officers, including the commander of the country’s air force, but did not replace Saleh’s son, nephew, and other allies, who head important military units. Currently, Saleh’s eldest son Ahmed commands the elite Republican Guard, his nephew Yahya heads the central security services, and another nephew, Tariq, controls the Presidential Guard. Yemenis have held many demonstrations across the nation to demand the political restructuring of the country and the dismissal of members of Saleh’s regime from their government posts.